Closely related to the iconic oak tree of the Old South, the Escarpment Live Oak is surprisingly well-adapted to life in the Albuquerque area. Native from Texas, Oklahoma and into the mountains of northern Mexico, this long-lived tree is among the few broad-leafed evergreens we see in our area. Quercus virginiana var. fusiformis (also known as Quercus fusiformis) is an excellent choice for a focal point in a small space or as part of a mixed planting for privacy or wind protection. Rough, dark brown bark and a gnarled form add to the character of this plant. Tips for success: When drought stressed, this tree is more susceptible to oak wilt and rot – be sure it gets watered deeply according to our watering recommendations. Best in alkaline, well-drained soils, but tolerant of clay. Don’t be alarmed during the 2-4 week period in spring when the leaves turn yellow and drop – this is to be expected. In the wild, the tree is multi-trunked and shrubby, naturally tending to form thickets, but it can be pruned into and grown as a single-stem tree. Its sturdy canopy provides cover and nesting sites for birds and mammals, and its elongated acorns offer a food source for a variety of wildlife. Branches can be selectively pruned for use in holiday arrangements and wreaths. 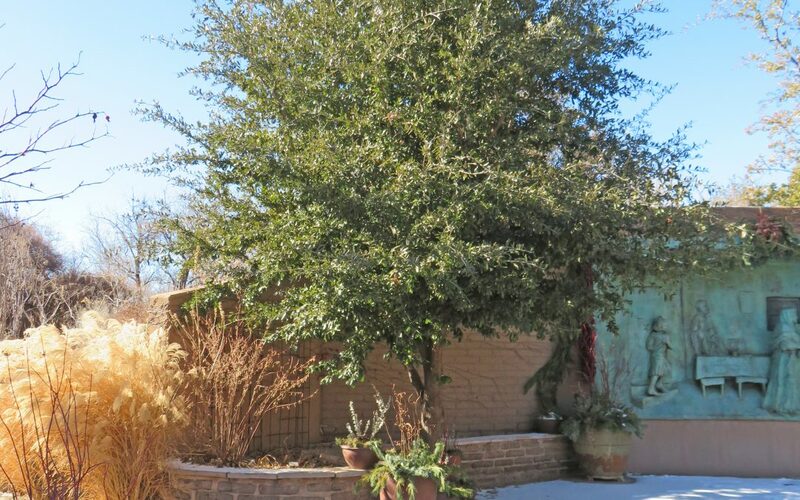 Check out a beautiful example of this stunning tree near the copper relief in the Curandera Garden at the Albuquerque Botanic Garden and in the parking lot of Explora.